In capitalist societies how does one question the content, methods of distribution, and value of art? These complex attributes cannot simply be viewed under an artistic lens but instead must be expanded within the larger context of cultural paradigms. Surely art is, among many things, a social and political tool. Re-framing it this way, it becomes quite difficult to define an unassailable definition. It cannot simply be reduced around the creative products of the artist; more is demanded from the culture and environment within which the artist exhibits their work. In other words, art must be acknowledged by the proper channels. In Western culture, having one's work acknowledged within the artistic discourse can be an increasingly difficult barrier for an artist to break through. However, there are many who have worked through Marxist ideals (whether consciously or not) to make some headway in dismantling this dominant ideology. This “revolution” of sorts is especially witnessed in specific texts produced by three seminal artists over the course of the past half century: Andy Warhol‟s Brillo Boxes (1964), Joseph Beuys‟ I Like America and America Likes Me (1974), and Radiohead‟s In Rainbows (2007). When reading these texts through a Marxist framework, I hope to demonstrate a sort of “light at the end of the tunnel” for aspiring artists confined in the David and Goliath struggle of proletarian versus bourgeois institutions. Here is a call to action! First, a working construct of Marxism must be established. Marxism, like all political ideologies, can be lofty and complicated and therefore for the purposes and scope of this essay will remain base and generalized. Ultimately, all art interacts with structures of power within society. It reflects the dominant cultural modes of thinking or works rebelliously against them. Art enforces political agendas (e.g., propaganda) or serves as a reactionary polemic. Marxism advises that art is product designed by and tailored for the consumption of a specific class: the bourgeoisie. The bourgeoisie are the educated elite of a certain race, background, and wealth all of which predicate artistic readings. This limits who can own, critique, or even participate in the artistic discourse. Those not of the upper echelon are considered proletarians. As Theirry de Duve so eloquently summarized, “What then is a proletarian for Marx? He is someone…who finds himself to have everything to lose from the capitalist regime and everything to gain from its overthrow” (Last of Proletarians 52). Conversely, the bourgeoisie must be the very opposite: institutions which strive to keep their positions of power by maintaining the status quo. In working through these constructs I‟ve determined that art exists in a capitalist ideology fragmented into three specific categories: its content, its distribution, and its attributed value. In their own methods Andy Warhol, Joseph Beuys, and Radiohead understood this and have channeled their art, with one or more of these attributes, to critique and erode this system. A second construct must also be defined: What is art? To look to the philosophical debate as to who or what claims art, one must first examine contemporary theory. Arthur Danto, a famed critic and philosopher, has offered his thoughts as to why art can be considered such in his essay “The Art World.” It is within this essay that Danto defines the economic, cultural, and social community that in turn defines what art is and this serves as the perfect place to begin. Collectively, the Art World is an intangible network of individuals (artists, critics, curators, etc.) and institutions (galleries, museums, etc.) which serve to define art by what it lets through its doors and what it chooses to feature in the discourse. This network also values said art through the practices of buying, selling and appraisal. Therefore, art is essentially nothing more than what this network acknowledges. A painting in someone‟s attic is not art but that same painting hanging in an artistic institution is art. These institutions maintain their power as long as the aforementioned groups of individuals continue acknowledging them. Now let‟s turn to Andy Warhol and his Brillo Boxes. One major stab at bourgeois artistic institutions can be found in the method and madness of Warhol. Andy Warhol rose to unruly celebrity status during the 1960s for both his exciting art as well as his wild reputation. Credited at the forefront of the pop-art movement, Warhol has been attributed with bridging the elitist divide between high and low art. Much of his work was rooted in either celebrity culture or the mimesis and representation of commercial industry. His often sly, though sometimes blatant, satire of commercial and industrial production can be seen in everything from the content of his work, his reproduction printing methods, and even in his workspace which he deemed “The Factory.” In 1964 Warhol constructed what would be a major artistic achievement in the Brillo Boxes. This series of wooden boxes was designed to replicate cartons of Brillo Brand Soap Pads, a common household item at the time. Warhol‟s wooden boxes were so meticulously constructed as to be “virtually indistinguishable from their cardboard models” (365 Takes 35). Extremely controversial when first show at the Stable Gallery, many questioned the validity of Warhol‟s piece as art. The empty gallery space had been piled high with Brillo Boxes looking more like a commercial warehouse as opposed to a typical gallery exhibit. Now, in referencing the three possible criteria we‟ve set up to critique the capitalist aesthetic of art, Warhol‟s Brillo Boxes do challenge class elitism with their content. However, in both its distribution (through the gallery) and in its value (institutional appraisal) this work is of traditional ideals. Arthur Danto understood that Warhol subversively rode his wave of success and celebrity to critique the very status of art from his insider standing within the art world. While specifically commenting on the Brillo Boxes Danto noted that, “outside of the gallery they are just pasteboard cartons…what in the end makes the difference between a Brillo Box and a work of art consisting of a Brillo Box is a certain theory of art [that] keeps it from collapsing into the real object which it is (Art World 581). Because, and one may argue only because, the gallery elected to show Warhol‟s work was it ever considered art. But to view it so cynically in this manner is to completely miss the point. It was through Warhol‟s consistent play on what he could enter into the Art World that scathingly satirized the institution. This is prevalent in a great majority of his work and that of Pop-Art in general. Warhol bridged the gap between high and low which consequently bridged the gap between varying segregated economic and socio-cultural groups of individuals. He disrupted the bourgeois class by attributing everyday items of the proletariat to art. He uplifted and elevated the culture of the low class, be it their consumer items or their idols of American celebrities and worked to create texts for a greater society without class segregation. Moving 10 years into the future finds us Joseph Beuys. Beuys was a contemporary of Warhol and the two had worked together in the past. In 1974 Beuys staged a performance piece within the New York Gallery. As an already established German artist, Beuys had made a name for himself with his politically challenging work and his mythical personality. It has been documented that Beuys fabricated his life‟s story with outright lies (such as being the survivor of plane crash) and certain attributes which posed him as everyone from Christ to a common rebel. For I like America and America Likes Me (1974), Beuys was taken from an airport to the gallery in an ambulance so as to not set foot on American soil. Once in the gallery Beuys spent several days with a coyote and a floor littered with copies of the Wall Street Journal which the animal would defecate on. Beuys‟ work critiqued both the valuation of art as well as the upper echelon of Bourgeois politics that Danto named the Art World. This was the tail end of the Vietnam War and a counterculture of social and political unrest had become vital to a proletarian social class made unprecedentedly aware of their world through media. Beuys and Warhol shared many ideals. Beuys considered himself literally of the proletariat. He viewed himself and his work within this Marxist framework. According to de Duve, “Beuys based art on will and thus on a principle of production, and Warhol on desire and thus on a principle of consumption; that Beuys believed in creativity and Warhol did not; and that for Beuys art was labor while for Warhol it was commerce” (Last of Proletarians 62). While Warhol worked more within the Art World to offer subtle critiques through his subject matter, Beuys really felt he could change this system. Both the content of his work, in texts such as I Like America and America Likes Me, and in his personal ideology, Beuys was one of the „common folk‟ whose labor contribution just happened to be his art. Of the three criteria this essay is working with, Beuys fits two: his work in content is quite critical of the dominant ideology of capitalism and due to the performance aspect of his text, it cannot be commodified into a specific monetary value. Galleries could not buy and sell what spanned temporal and spatial constraints into a tangible good. However, the performance did still acknowledge artistic institutions, and therefore the larger separation of social classes, by Beuy‟s staging it within a gallery. Transported thirty three years into the future, a critically beloved British band would come along and stun the world of popular culture and challenge all three criteria of the capitalist framework. Radiohead, as a band, have always been considered at the forefront of the music scene. They‟re critically lauded; for example their seminal album OK Computer (1997) has been considered by more than one music publication to be the greatest album of the last 30 years. It is also well known that with each successive album offering, Radiohead tends to radically deconstruct their sound: from acoustic folk sensibilities to arena rock to prog-rock, German techno, electronic, space-age, ethereal and ambient. In 2003 with the release of their sixth studio album Hail to the Thief, Radiohead had officially met the requirements of their recording contract. As one of the most respectable bands on the planet, many eagerly awaited their next move, including which company they would choose to sign with. 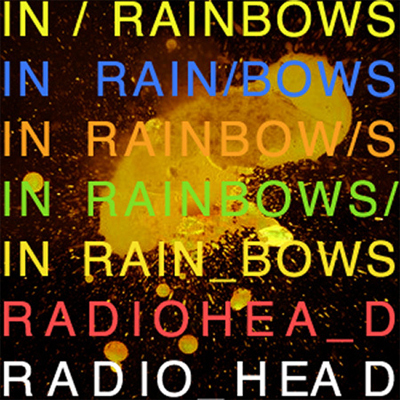 In October of 2007 the world learned from Radiohead‟s own website that in one week‟s time their next album In Rainbows was to be released…and it was not to be featured on any record label but available for download through their site. This sudden and shocking move startled the music industry (and earned Radiohead quite a lot of press / praise). When relying on a record company, marketing and distribution take months at the minimum which allows for both word of mouth and pirated leaks of an album to post online for discussion and debate well in advance. By choosing this online method of distribution Radiohead took everyone by surprise and the ten days between their initial announcement and the delivery of the product were a kinetic and supercharged kick in the pants to an ever more stale recording industry. In Rainbows is a beautiful album full of at-once haunting and rocking songs that are critical of dominant social and political ideologies, themes Radiohead have always worked with. Songs like “Bodysnatchers” discuss the role of an ever-weakening public consciousness due to corporate takeovers, big business, and their bedfellows: politicians (can anyone say the Bourgeoisie?). There are many different avenues with which to approach this exciting text through Marxism and an important aspect focuses on the fact that ultimately, unlike Warhol‟s Brillo Boxes or Beuys I Like America and America Likes Me, In Rainbows is a digital text. What this essentially means is that Radiohead‟s artistic output is not a unique and singular work, it is a reproduction and because the tracks were recorded digitally, there is truly no original either. As Walter Benjamin stated in The Work of Art in the Age of Mechanical Reproduction, “The authenticity of a thing is the essence of all that is transmissible from its beginning, ranging from its substantive duration to its testimony to the history which it has experienced” (Media 21). What Benjamin theorizes is that with Western art a lot of our focus and attention has been directed towards its uniqueness. With the wave of new digital media and the ability to construct work to be reproduced and transmitted infinitely, critical readings of work can cease to be dominated by the aura of a singular work and instead focus of the political value of its content. Radiohead already had the upper hand by working in a medium that is accepting of duplication but they took it one step further in disavowing all tangential bourgeois involvement. When Radiohead released their online album for download it came with an additional caveat. At a time when the standard ITunes listing price of a full album of digital music is $9.99, Radiohead asked their fans to set their own pay-to-own price, and this system included the option to pay $0.00 for entirely free music. By shifting the valuation process from big business and record companies (ITunes or any record label shilling CDs) and putting it in the hands of the general population, Radiohead were essentially bypassing the equivalent of the Art World for the music scene and asking their fan base (the proletariat) to value music and ultimately the worth of the art. This actually reignited many philosophical discussions regarding the worth and value of art in general and who gets to dictate this price. When examining the three criteria for judging work in capitalist societies, we find Radiohead successfully challenging all three. Their work in content has always been critical of the establishment, whether it be the defiant rejection of typical song structure (e.g., abdication of choruses) or through lyrical prowess. 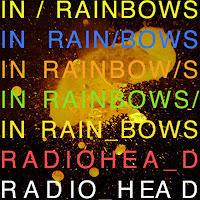 In Rainbows not only refused to be acknowledged by the artistic institution (the record labels) but refused to acknowledge them in return. Lastly, they didn‟t allow either themselves or bourgeois institutions to determine the value of their work but subjectively allowed every individual to value it for themselves. They gave the ultimate power to the proletariat in a deep symbol of respect this class. And in the interest of full disclosure it is worth noting that due to avoiding record companies, tangible product to produce and distribute, marketing campaigns, etc., all of the money Radiohead made through this release was theirs for the keeping. They have yet refused to make public just how many individuals downloaded the album or the average price paid, but it has been estimated that this figure is leaps and bounds larger than the band would have recouped from a traditional release. Ironically, in challenging the capitalist ideology, Radiohead profited even stronger. Ultimately, this is a very exciting time to keep our eyes upon the Art World. The artists discussed in this essay are only three of many that have figured the dominant capitalist ideology has been around long enough and in their own progressive methods have called for change. They‟ve signaled the death knell. Whether others will follow remains to be seen. One final detail to note is that none of these artists could have worked such critical texts into the proper channels unless having already been acknowledged by the system they were critiquing in the first place. The dominant ideology is one that must be dismantled from the inside. As de Duve stated, the bourgeoisie is a “capitalist regime” and has everything to gain by maintaining its powerful position on top. Warhol, Beuys, and Radiohead understood this and whether they‟d admit it or not would probably like to see an equality of art, in value and distribution. As Benjamin wished, mechanical reproduction allows art to cease being overshadowed by its unique ritualistic singularity and make contextual readings of content the normative. The digital front is where this will occur. An ideological shift is coming, is the Art World ready? Andy Warhol: 365 Takes. The Andy Warhol Museum, New York: 2004. Benjamin, Walter. “The Work of Art in the Age of Mechanical Reproduction.” Media and Cultural Studies. Eds. Durham, Meenakshi G. & Douglas Kellner. Blackwell Publishing, MA: 2006. Danto, Arthur. “The Artworld.” The Journal of Philosophy, 61, 19, 571-584. 1964. De Duve, Thierry. “Joseph Beuys, or The Last of the Proletarians.” The MIT Press. 45, 47-62: 1988. Rosenthal, Mark. Joseph Beuys: Actions, Vitrines, Environments. Yale UP, Connecticut: 2004.